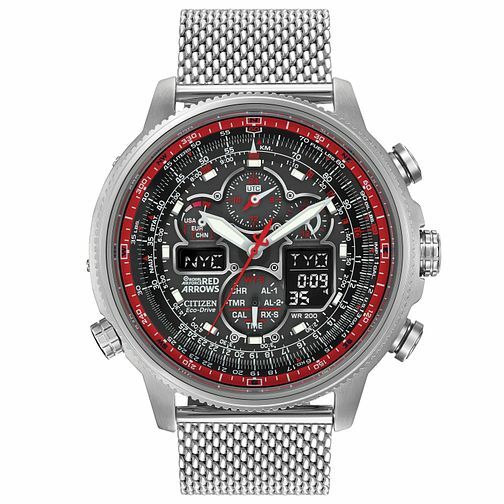 Striking black and red chronograph stainless steel bracelet watch from the Citizen Eco-Drive Red Arrows range, in association with The Royal Air force. Citizen's keen eye for innovative technology is reflected in the radio controlled watch's features, including water resistance to 200 metres, perpetual calendar and digital display light. Citizen Navi Hawk Men's Stainless Steel Bracelet Watch is rated 5.0 out of 5 by 4. Rated 5 out of 5 by Anonymous from Stunningly bold and good on the eye The thing that appeals about this watch is the bracelet, it's really unusual and oozes class. Butterfly clip which is so much easier and comfier than normal clasp and all this without mentioning the face. Grey and flashes of red, bold and gets noticed. I like this watch and would buy another eco-drive. I've been a Tissot man to date but getting converted.